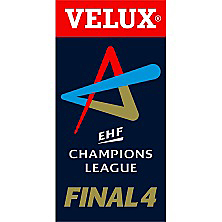 And so after a weekend of some predictability and some drama the final entrants into this season’s EHF Champions League are known: the long road to Cologne and the Velux Final 4 can begin. The three qualification tournaments didn’t produce close finals: HCM Constanta (Romania), HC Metalurg (Macedonia) and RK Partizan (Serbia) saw off their opponents by an average of ten points. The fourth event, the Wild Card Tournment, did produce a decent contest though as home side Saint-Raphaël Var (France) were pipped in extra time by HSV Hamburg of the Bundesliga. It was tough on the French side, in particular their goalkeeper Yohann Ploquin, who blocked well at crucial moments only to see his outfielders not drill home the advantage. Saint-Raphaël Var had a lead of up to 4 at various points in the second half of normal play and Hamburg were only actually in the lead for the final seconds – taking the game 32:31 with Blazenko Lackovic scoring the winner with his only goal of the match. There are full details of the groups here and British Eurosport 2 should be showing some games live from late September, in addition to which you should be able to find regular live matches at the EHF’s own site and on Bet365.